The year 2018 marks a notable milestone in the history of stem cells and regenerative medicine. In the last 20 years new technologies such as induced pluripotent stem cell lines (iPSCs) and CRISPR/Cas9 editing are expanding the possibilities offered by pluripotent cell therapeutics. At the same time, a parallel interest in activating and utilizing endogenous regenerative capabilities in patient populations has benefitted from advancements in molecular assays and information processing. However, as of the publication of this article, the FDA still recognizes no efficacious therapy for the preservation or restoration of hearing, an astounding admission in light of the numerous advances seen in other, related areas. 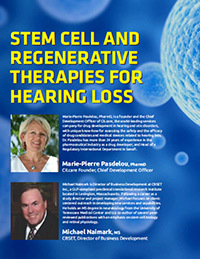 This article discusses the recent advances in our understanding of auditory pathways and the discrete mechanisms underlying auditory function, as well as the recent research in stem cells and regenerative medicine that lead us to believe that real, viable stem cell and regenerative therapies for hearing disorders will become a reality in the near future.